A light cone has been turned on Italy and its culinary heritage for the 2014 appointment of Gastronomika, the most exclusive international event dedicated to haute cuisine. A triumph of Italian taste landed in San Sebastian, in the north of Spain, bordering on the Pyrenees, which for over fifteen years brings together the best of national and international gastronomic scene, as Mejor de la Gastronomía required. 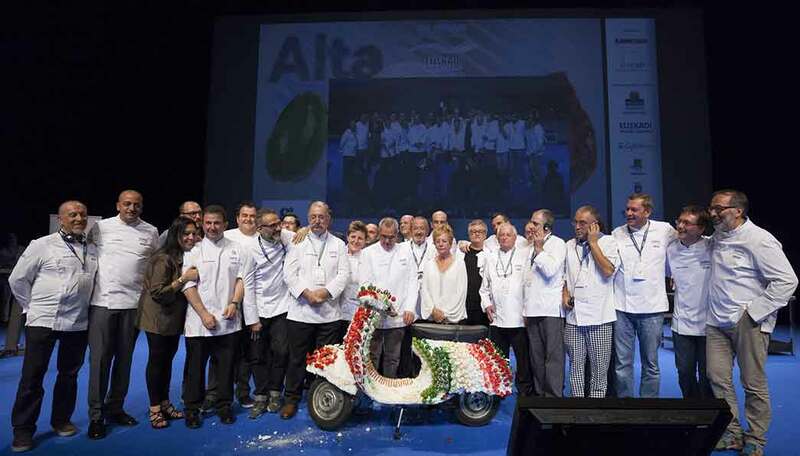 Yes, because the guest of honour country at “what many people consider the world’s best culinary conference”, as stated by its director, Roser Torras, this year was, of course, our beautiful Italy. The Basque city, famous for having the highest number of Michelin stars per capita, was tinged with green, white and red, and, repeatedly pronouncing the slogan “Italy: North vs. South”, which accompanied the festival, saw, from October 5th to 8th, 24 Italian chefs alternating on the stage and flooding with the Italian flavors and aromas the meeting room of Palacio Kursaal, the two ultramodern translucent glass cubes, designed by Rafael Moneo, on the coastline. A great parade of stars, 30 for the red guide, from Massimo Bottura to Carlo Cracco, from Gennaro Esposito to Andrea Berton, and then David Scabin, Niko Romito and Moreno Cedroni, just some names, presented during the four days of performances, workshops and tastings, the many regional cuisines and the products that enrich our country. Therefore, not only one, Italy is a big puzzle of cuisines, just like the country itself that, until a few centuries ago, was a collection of duchies, kingdoms and republics with all the gastronomic singularities that such a fragmented scenario involves. The pizza is no exception to this diversity and so we find the meter pizza, the rounded pizza, which you can fold into four layers (the Neapolitans call it pizza a portafoglio), both baked and fried. To represent these varieties Enzo Piccirillo, guru of the fried pizza, Raimondo Cinque, for the meter pizza, and Enzo Coccia, master of creativity, which, for the occasion, made the Pizza San Sebastian. In the speech that preceded the presentation of his new creation, a new version of his Santa Lucia (little piennolo cherry tomatoes, fresh garlic, parsley, olives and oregano) with the addition of Cantabrian anchovies, an homage to the foodie capital of Spain, Enzo highlighted that the pizza is GASTRONOMIKA, that is the identity and the environment, the products, respect for the tradition, the clientele and the professional ethics. Unfortunately, we noticed that, unlike us, the Spanish are able to work as a team, it would be better that we open our eyes and update ourselves, what better time to prove it at EXPO 2015?